This is the last version of Fondain's classic tinfoil design. It is essentially identical to the 1879 model, however in an apparent attempt to save on production costs he eliminated the elegant decoration of the earlier model and changed to a bronze-colored lead paint called 'minium'. Fondain did make one small improvement at the same time, however: he added a simple curved piece of metal to the speaker arm below the adjustment screw to prevent it from falling forward and possibly damaging the horn. This simple improvement only allowed the arm to tilt a short distance, enough to conveniently remove and replace the foil. Despite his cost-cutting attempts, Fondain's company went bankrupt in April 1881. Nothing his known of his later activities; he disappears from phonographic history. Fondain's phonograph venture was taken over by Eugene Ducretet, who went on to produce similar phonographs under his own name. 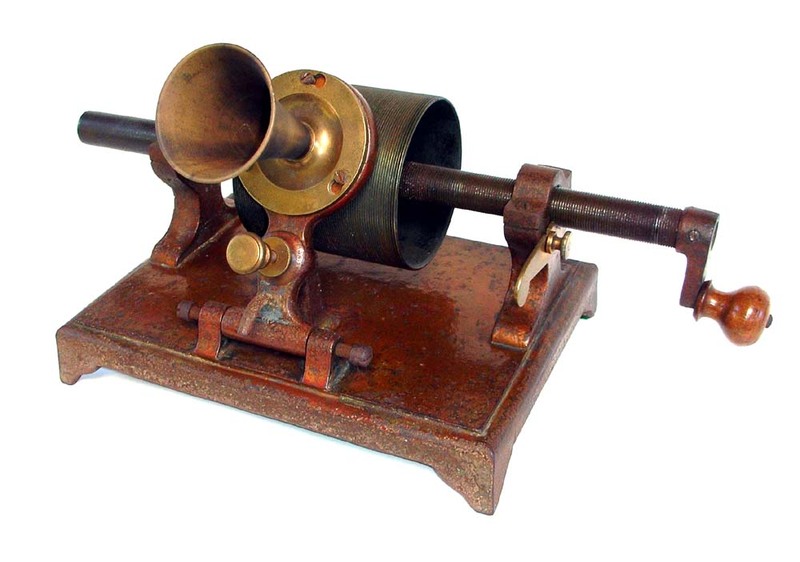 A comparison of the 1879 and 1880 models of Fondain's tinfoil phonograph. Note the curved rod below the adjusting screw on the speaker assembly of the 1880 model, to prevent the speaker arm from falling forward and damaging the horn.